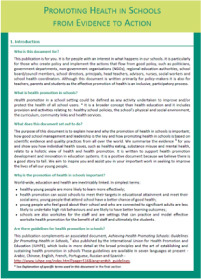 The purpose of this document is to explain how and why the promotion of health in schools is important; how good school management and leadership is the key and how promoting health in schools is based on scientific evidence and quality practices from all over the world. We summarise the evidence 1 for you and show you how individual health issues, such as healthy eating, substance misuse and mental health, relate to a holistic view of health and health promotion. 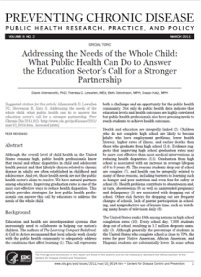 It is written to support health promotion development and innovation in education systems. It is a positive document because we believe there is a good story to tell. We aim to inspire you and assist you in your important work in seeking to improve the lives of all our young people. Health and education are integrally linked (2). Children who do not complete high school are likely to become adults who have employment problems, lower health literacy, higher rates of illness, and earlier deaths than those who graduate from high school (3,4). Evidence suggests that improving high school graduation rates may be more cost-effective than most medical interventions in reducing health disparities (3,5). Graduation from high school is associated with an increase in average lifespan of 6 to 9 years (6). The reasons students drop out of school are complex (7), and health can be integrally related to many of these reasons, including barriers to learning such as hunger and poor nutrition and even fear for safety at school (8). Health problems contribute to absenteeism and, in turn, absenteeism (9) as well as unintended pregnancy and delinquency (5) are associated with dropping out of school. Other risk factors for dropping out are frequent changes of schools, lack of parent participation in schooling, and nonproductive use of leisure time, such as watching many hours of television daily (8). 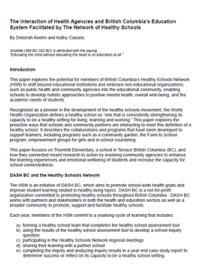 This paper explores the potential for members of British Columbia’s Healthy Schools Network (HSN) to shift beyond educational institutions and embrace on-educational organizations, such as public health and community agencies into the educational community, enabling schools to develop holistic approaches to positive mental health, overall well-being, and the academic needs of students.